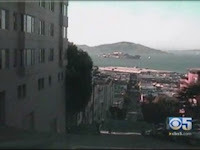 SAN FRANCISCO (CBS 5) ― Forty-one years after the movie, "Bullitt," cars are still bouncing around Russian Hill. But a series of recent incidents have San Francisco Police worried that it could be getting more dangerous. "It's called 'hill flying,'" said Lt. Victor Tsang of the San Francisco Police Department. Thrill seekers taking advantage of San Francisco's steep topography accelerate up to the crest of the hill and then soar through the air. Often the driver has an accomplice shooting video with a cell phone, and the video ends up on YouTube. Sigrid Wallach, a Russian Hill resident, shot video of a car that lost control, then crashed and burned on Jones Street near Green on August 6th. She said hill flying is constant, at least once a week. "They blow through the stop sign and go airborne over the crest of this hill," Wallach said. "I think it's an outrage that they would come to Russian hill and engage in this activity..."
The police have taken to leaving a cruiser parked at the top of the hill overnight, and we've noticed more patrols. Mission accomplished.